HILL AIR FORCE BASE, Utah — Construction crews will soon be starting a paving project on South Gate Avenue that will affect traffic in and out of the South Gate. The first phase of the project starts April 15 and will run to the end of May. 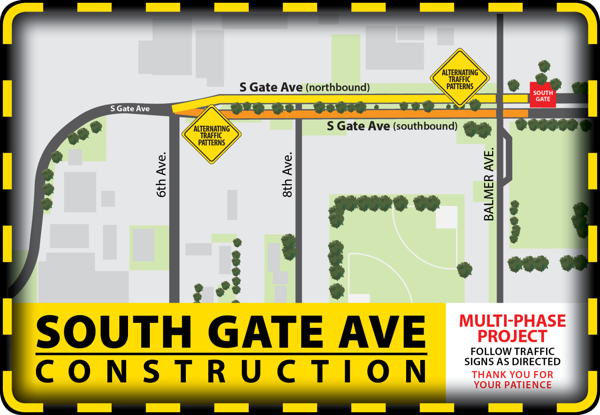 During construction, south bound lanes through the gate will be closed and traffic will shifted over to the north bound lane. The current restriction which prevents turning onto Balmer Street during the morning commute will be lifted. To help traffic flow during peak hours, there will morning and afternoon traffic control plan in place. There will be two lanes for north bound and one lane for south bound vehicles. The traffic pattern will shift at noon, with two outbound lanes and one inbound lane open for vehicles. To avoid delays, drivers are encouraged to use other gates during the construction period. In addition to the West and Roy gates, the East Gate will be open from 5 a.m. to 5:30 p.m. from Monday to Saturday. Anyone attending golf tournaments will be required to use the East Gate to gain access to the golf course. Midway through May, traffic will shift to the south bound lanes and the north bound lanes will be closed. The traffic control plan will also shift accordingly. There will be additional phases to the project throughout the summer, as the entirety of South Gate Avenue will be repaved. The full South Gate Avenue paving project is expected to be complete by August. Follow Hill’s website at www.hill.af.mil and Facebook page at facebook.com/hillairforcebase for continual updates. Drivers are reminded to exercise caution wherever construction workers are present. For more information on the project, contact Tommy Monzon at 801-775-3316.